The world woke up this morning to the news of the death of one of the best talents in the world of marathons. Kenya’s Samuel Wanjiru who won his country’s first ever gold medal at the Beijing Olympics and went on to conquer major marathons in Chicago and London, died after jumping from the first-floor balcony of his house. Olympic marathon champion Samuel Wanjiru has died after a tumble from a balcony, according to reports in his local Kenya. Kenyan military after suggested that a 24-year-old leapt to his genocide shortly after 11pm on Sunday, after evidence with his wife. 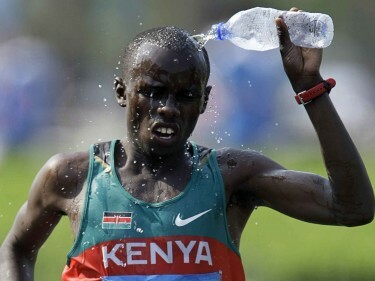 Samuel Wanjiru – Beijing Olympics 2008 (courtesy of www.mzungofire.blogspot.com). So unhappy to hear about Sammy Wanjiru. He was a fable and still so young. So sad to hear about Sammy Wanjiru. He was a legend and still so young. Only if he could realize life’s a marathon too, and won it. RIP, young boy. 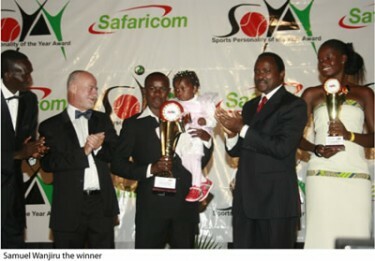 Samuel Wanjiru 2008 SOYA Winner – (courtesy of SOYA). A brief window into his life show that he had become one of Kenyan's leading marathoners having secured the 2005 Most Promising Sportsman of the Year Award, having won and broken the world half-marathon record in Rotterdam. He went on to become the first Kenyan ever to win a marathon in Beijing Olympics and in the same year came 2nd in the London Marathon sending warning signals to his rivals. His exploits had seen him secure major sponsorship from Japan and also enjoying attendance fees of upwards of US$ 50,000- 100,000 per race. SportsKenya had ranked him as one of the top earners in sports in the year 2010 in an earlier post. Little did we know this would be our last one of him being alive. Ombati said the athlete’s wife Triza Njeri had come home to find Wanjiru in bed with another woman had locked the couple in the bedroom and ran outside. Wanjiru then leapt from the balcony, he said. Ombati said Njeri and Wanjiru’s female companion are assisting police in investigating the death. Sources indicate that Wanjiru spent the day drinking at a Pub in Nakuru in Kenya’s Rift Valley province and later headed home to Nyahururu. It is further said he took his last meal at a place called Tas in the town before he took home a prostitute named ‘Martha’.It is said his wife then caught the two lovebirds before an argument ensued between the wife and the call girl. The news also made headlines on Twitter, easily becoming one of the top trending topics with the hashtag #SamuelWanjiru. I am totally shocked of the news of the death of Sammy Wanjiru.